A shader node that can texture objects with a UV Pass (also known as Re-Texturuing). Such a node would allow us to render out 3D Models as still images, (or video - depending on bit depth, but at very least 16 bit colour is needed- so more like Image Sequences) and Re-Texture the model (within the image) with any other texture in the future- without having to re-render the scene. This could either be as a seperate Node- or incorporated into the Shade with Vertex Attribute node. Only XY colour is important, (being Red and Green), Blue is set to 0. Attached is an image of Texture Coordinates setting in Shade with Vertex Attribute (left) - right is a ShaderToy I made showing a simple UV Pass texture. The compliment node to this would be a re-texturing UVPass shader that would be able to re-map an image or video to the UV coordinates baked into the image. This would allow complex 3D scenes to be rendered from other software (Maya, Cinema4D, Blender), imported as images, and then re-textured in realtime, without any 3D heavy lifting at all. Very cool. @jaymie I'm thinking maybe this should be a pro feature? Other plugins that allow this in After Effects are quite expensive (at least the cost of Vuo Pro) so it would make sense that this is a premium feature. Also the workflow is quite advanced, and would also allow Vuo Pro to stand out even more. Good point. Yes, let's make the UV pass shader node Pro. Also as it's an advanced feature it would be best to make this for pro users - and having a simpler more streamlined Vuo standard makes sense- then more advanced features are there in Vuo pro. 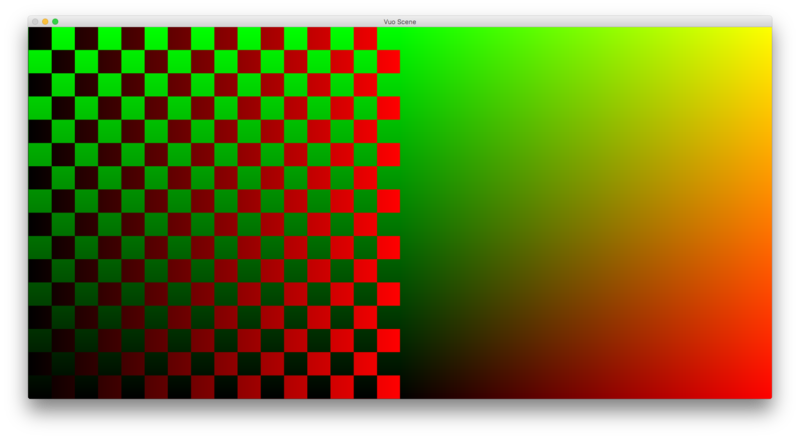 We did the easy part, adding a Texture Coordinate (Gradient) option to the Shade with Vertex Attribute, in Vuo 1.2.4. The proposed retexturing node remains open for voting.